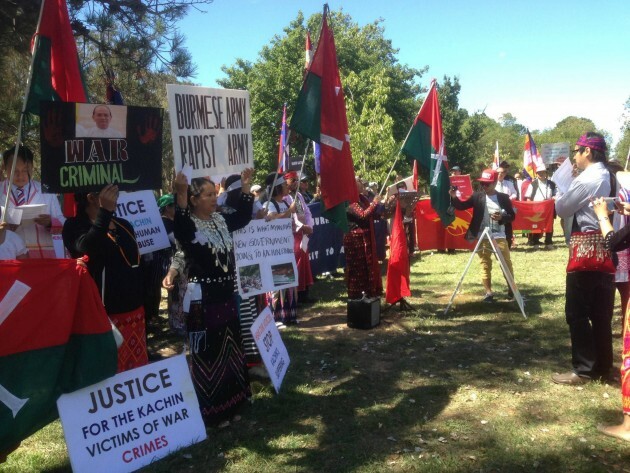 More than 200 Burmans based in Australia staged protest against the president of Burma, U TheinSein during his visit in Australia from News Zealand on March 13. Saw Kyaw Kwi, an Australian based Karen News reporter said protesters demonstrated in front of the Governor-General’s house in Canberra for two hours before continuing to country’s parliament to protest further. with an open letter with seven demands to give to U Thein Sein. The protesters letter demanded an end to dictatorship in Burma, the end of the 2008 constitution, to release all political prisoners, to stop military offensives in ethnic areas, to work on building peace and the implementation of a nationwide ceasefire. Saw Kyaw Kwi said that there were two groups of protesters. One group composed of 100 ethnic nationalities from Burma now living in Australia and led by the Joint Action Committee for Democracy in Burma (JACDB) and a group of about 70 Rohingya. Mahn Orlando, the JACDB’s chairman said. Saw Lwe Moo, a participant at the protest said. Presedent U Thein Sein met with Australian Prime Minister Julia Gillard and held a press conference after the meeting. The Australian Prime Minister gave speeches about assistance to Burma and according to sources close to President U Thein Sein, Australia will restart its defence cooperation with Burma’s military.